When our friends go on journeys, no matter what kind, it is our pleasure or pain to watch them meander and explore. We support and encourage in every way possible, but it is their journey in the end. Some of us have journeys of passion and others journeys of survival. As friends, we have to support and be strong for our friends no matter what kind of path they have before them. My dear friend lost her daughter yesterday to a long and hard fought battle against brain tumors. Hers will be a battle of her own survival now, and she will be carried along as much as possible by her friends and family, but I want to honor the journey she will take on her own. I want to encourage her to have strength and courage as she begins this new part of her path. A mother’s love goes on and on, and so must the love that surrounds her. Her daughter was a sweet and kind soldier with a positive mindset and never ending love for those around her. She is a hero and should be remembered for her bravery, the kind that many of us will never know. I honor her memory and her light that she was able to shine on so many of us around her. I will think of my friend and smile, and think of her daughter and feel gratitude for the way she was able to show us what true love and compassion really means. Rest in peace sweet Alexa, you will forever be in our hearts. My mind is a playground and sometimes I just let it play and I don't write things down. It runs and skips and splashes in puddles. It giggles and does cartwheels and flying penny drops. Other times my mind paddles a heavy canoe down a long murky lagoon and gets tired. There are times after I have let my mind wander that I wish I had written more things down. I know I had some good thoughts, some that made me pause and consider, grow and ruminate. But, like with any growing pain, it's the ultimate growth and change that matters more than the pain. You don't really remember the pain exactly, only that it happened. I have learned to be thankful for the growth, and even the pain. Every romp on the playground, row in the boat and time spent in the nothingness are steps taken in the right direction toward a more positive and happier me. And that, in the end, is what I need. All of life happens within your own mind. You have complete control over everything that happens within your mind space. The perspective by which you view the world is completely safe within your beautiful mind. If you only make one effort toward your own personal development and becoming a more positive thinker, make it about your perspective. Throw your effort into shifting your mindset, it is really the only change you have to make. It’s much harder to try changing those around you and so simple to make change within yourself. In this sense, your own mind is the low hanging fruit, so why not make this easy? Take time to turn off the noise being made by others and let yourself decide how you feel. Let your mind play and be free of judgement as it runs like a child and just simply enjoys life. Decide how you feel before you ask others or turn on technology and let that noise come rushing in. YOU are in control of your own mind and YOU decide the rules on your playground. Play nice, play hard, play often. It's so easy to be influenced by others, the key to being more positive is learning to stand strong in the worth and value of your own thoughts before you take on those of other people. While people all around me were marching to show what is in their hearts, I sat mothering my sick child, and my sick self, doing the important work that is often belittled by those who were not marching. I support everyone doing their part to protest, support, shout and make change. I sat surfing social media to hear the words of Michael Moore, Ashley Judd, Gloria Steinham and others who spoke their truth and I couldn’t help but wonder why we are still having to protest this stuff. A young Gloria may have imagined her older self living in a more changed world, but still we march. Yes, the world has changed some, but progress does not always charge forward in a straight line. We are forced to duck and weave along the way, but still we gather our people and fight the good fight. By living the change in our everyday lives, we will hopefully mold the next generation into a strong, but peaceful bunch that will continue to fight for what they know is right. We create change slowly in our own homes and throughout our days. Let your children watch you conduct yourself in a way that shows them exactly how to make positive change. Get up and march with the masses, but don’t forget to stand up in front of the smaller crowds and make your heart and voice heard. Make your life an example and know that you are leaving a legacy of peace and kindness. And all the while remember how much farther we have come than so many other countries in the world. Pause for a moment when you think of such things and be grateful, because so many millions of women around the world have so much less than we do here. As for the BRIGHTEST side of all this… let this be an opportunity to take it all in and consider how you really feel, not how others are telling you to feel. Consider the country where we live and all that it does and does not stand for. Find your tribe and be confident in who you present to the world, but don’t section off and ignore how others are experiencing this as well. Whether or not we are on the “same side” or share similar beliefs, I hope this time allows people to pause and consider. It’s about getting to know each other, not getting to hate each other. It’s important to stop and understand why a person may feel the way they feel. Every person has a story, take the time to learn it. I see mass unfriending happening on Facebook and I see families at odds over their feelings about our new President. Let each person be who they are and love them unconditionally if you dare ask the same of them. Separating yourself and being surrounded by ONLY like minded people limits your human experience. Ask those other supporters why they feel that way. Read an article from another point of view. Let your Trump supporting, Republican father vent to you about all those liberals and hippies… you may gain a better understanding of him and that’s what this human experience is all about. This is a chance to get to know each other on a deeper level. Don’t worry about agreeing or being right, just be open to accepting some of your loved ones for who they choose to be and accepting them without condition. My Trump supporting, Republican father has always told me that I was given two ears and one mouth for a reason. In this case, that’s pretty good advice. My Dad has some pretty good reasons for his choices, and I have to respect that if I want him to respect mine. I see people coming together over a common cause because they believe it will truly make the positive change we wish to see in the world. That is an amazing thing to see. Be grateful that we live in a country where everyone’s voice is allowed to be heard and people feel free and safe to express themselves. As I have said before, I will continue to fight my own fights and enjoy my own successes, but the shining light that I see is how people have found a way to stand up and decide what they believe and share their passion with the world. We march with like minded sisters and brothers to share our message. Just for now, let’s focus on enjoying the freedom to do just that. And, if you broaden your perspective and take it all in, you just may gain a better understanding of the situation as a whole. Open your mind and change your perspective and you just may change your world. The colossal anticipation of a new year may be a false promise of a new start, or maybe it's not. It's not the flip of the calendar that creates positive change, it's you. The holiday season may fill you with a child-like anticipation of opening up a new gift. Will it be what I wanted? But, before you unwrap your gift, it sits like a beautifully wrapped promise with a big shiny bow and the hope of a dream fulfilled. Maybe you try all year to secure your place on “the nice list” with the hope of enjoying your reward, and then, as the December days go by, the anticipation of opening it is almost too much. You create your own hope, you create your own anticipation. Soon after, you toast with champagne on new years eve and feel the buzz as you anticipate the countdown to a whole new year filled with promise and new beginnings. But then, you wake up hungover to the same life you left the night before. You realize that you are only one day older and the same old effort is not somehow all of a sudden enough just because the calendar has flipped. OR, you decide that this year things will be different and you commit to making THAT your reality. You commit to living on The Brightest Side. I have yet to see a task too simple for people to complicate. I see people putting a lot of energy into making things harder instead of letting them be simple. But, if you simply decide that you want things to be better, or simpler, then they will be. I do think this new year is a gift. When you open a gift, if you think whatever is contained in that box is going to change your life, then it might. Change your perspective, change your world. We are the ones who give meaning to our lives, we shape our own reality. This year, take control and get better at making your life good. Become a master Storyteller of your own story. Whatever you do, just do it with positivity and intention, right now. Nurture your positive heart with radical kindness and those around you will feel it too. What flows through your heart begins in your mind, and because it exists in your mind, you have power over it. You have the power to lighten you thoughts. Lighten to brighten. Unclench your brow and relax your face. Close your eyes and look to the sun. Take a deep breath. Nature is the best medicine. Ever get radically upset by someone who disagrees with you? Ever feel completely altered by the acceptance or rejection of your feelings or felt deflated by someone ignoring a feeling you are passionate about? When you realize you have all the control to absorb or release each one of those thoughts, you will be able to let that stuff go. Letting it go is for you, not them. Lighten to brighten, and then you can nurture your positive heart. Relax, look up, deep breath. Let it go. Lighten your load in every way to brighten your world and enjoy your day. Decide to live on The Brightest Side. It’s taken me a few days to collect my thoughts and let all of this sink in. It’s quite possible that this country is going to change quite drastically, but it’s also possible that it won’t. We just don’t know yet, and it’s the unknown that feels so unsettling. Some of my thoughts since I learned about the results of the recent election…. How will I explain this to my children? What would my great grandparents who immigrated here for a better life think? Let us not forget the beauty of this life. Let us remember and cherish the allure and hypnotic trance of a breathtaking sunset, the delicacy and grace of a flower born from the patience of nature, and the soothing calm of the sun peeking out on a rainy day. 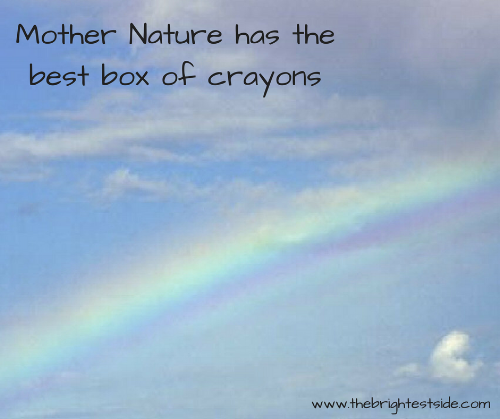 Mother nature is not only red or blue, she is all the colors of the rainbow. Take a break and enjoy them. Last week, the sky over the mountains was so magnificent in Colorado that I saw people pulling over to take photos and revel in it’s glory. Even here where we get to see this majestic landscape everyday, there are still moments that take our breath away. I hope I never get used to the exquisite sight of an orange and purple sky over the mountains at dusk. Life is good, nature is to be savored and we still design our own happiness one moment at a time. It could be worse, and for that I am grateful. I am confident that the reason my world seems to have changed so much this past week is because I let it. It’s time to get back to basics and remember to see THE BRIGHTEST SIDE of all this. I feel the same about the state of the nation right now. As much as I wonder how things will progress and what our new normal may become, I know that worrying about it will not stop it. Worrying only creates stress, not change. I did my part for the moment and I will continue to do the work that I do best. I will seek out ways to make change, peacefully fight the good fight and find likeminded people who make me feel like there is hope. I will be a good role model for my daughters and surround them with the beauty of nature and people that value dignity and kindness. I will distance myself and my children from those who revel in the negative tidal wave that seems to have overtaken many of us. I will not worry about moving mountains. I will be sure to do my part, but ultimately, I'll let the mountains move themselves. They include patience, tolerance, compassion and kindness. All of these exist inside me by choice. Every time I am patient, I am choosing to be patient in that moment. It's not a given that I will be able to exercise that power the next time I need to. I will have to choose patience each time that power is needed. Making that choice over and over again is part of living on THE BRIGHTEST SIDE. It takes as much muscle as lifting up a car with your bare hands sometimes. Superman ain't got nothing on me. If I can impart these super powers onto my children, then I am doing well as a parent. At times, it’s hard to stay positive and be the role model I need to be for my daughters. The stamina necessary to keep up with the demands of raising kids is enough to challenge any person, or super hero. This business of raising little people sure isn’t easy. But there is opportunity in every moment to choose positivity and kindness. Every parent has the choice of how to respond to the needs of her kids. Each parent is responsible for the quality of time they spend with their children and the kind of lessons they chose to impart when they have the opportunity. Use your powers wisely. Be the parent your child needs you to be. I've allowed my kids to teach me how to be a good mom to them. That's my greatest super power of all. My kids have taught me the humility and modesty to be wrong, flexible and strong. They have their own thoughts, reasons and curiosities. Our job as parents is to learn how to parent the child given to us, not to create the child we want through parenting. We can all do this with the wisdom and positivity that we cultivate over a lifetime of experiences. I think a lot about goals, dreams and intentions. I like to incorporate a good healthy balance of all of them when I plot and plan my future. I always like to be working towards something, it drives me and gives me purpose. Just as important as all the concrete life planning and goal setting is the idea behind writing a Bucket List. EVERYONE should have a few experiences in life that they hope to have and EVERYONE should write them down. So, what do YOU want to do before you “kick the bucket”? Part of being a positive thinker and living life on The Brightest Side is believing that you can accomplish the goals you set. Your thoughts are powerful, choose them carefully. Creating a Bucket List is only useful if you authentically believe that you can start making check marks. As for me, I have always admired the wisdom and kindness of The Dalai Lama. Even before becoming a Yoga Instructor, the Buddhist mindset always made sense to me. Being in the actual presence of his Holiness was a long time dream and it felt beyond magical to check it off my Bucket List. On the day the Dalai Lama made his visit to Boulder, Co, I drove up early to take a walk by the river to put some space between my chaotic day and this experience. I parked about a mile away to force myself to breathe and move before and after his talk. I knew it was up to me to make this experience peaceful, memorable and meaningful. We create our own reality, it’s up to me to make the most of times like this. His talk was rooted in community, education, kindness, and compassion. A compassionate mind means you can have peace. Humanity should have a goal to be more compassionate, for others and for yourself. We don't want to duplicate the same miserable century again. Fear is born from hate and anger and no real sense of compassion, so we need to change the way we educate the next generation so that we can raise more compassion hearts. He believes education is the key to a more compassionate world. And we don’t just need a little bit of kindness and compassion, we need a lot of it. We need years and years of a changed perspective achieved through a shift in our education system. He strongly believes that an educated, scientific mind mixed with common sense and loving kindness will lead to more compassionate people. It’s true that our current education system is not producing a happy community. The Dalai Lama believes that our best hope is major change. Current education is failing to do it. Inner peace means teaching our children true loving kindness. How do you raise kids with compassion while practicing the Buddhist theory of unattachment? You study the contradiction. You teach the next generation that common interests between all people are more important than individual needs, but at the same time, self love is vital. You have to care about yourself AND others, your interests and theirs. We have to learn to change our perception of “we” and “they” on a community level, but education systems have some responsibility for this change as well. In our current educational environment, technology is inhibiting our ability for deeper compassion. It’s our responsibility to help our children understand and shape their world to be better than the one we live in today. We have to guide them, talk to them, share what we’ve learned and gently suggest ways to make positive change. Gently, with compassion and good intention, showing them what we mean is the way to make positive change. One of the greatest obstacles to living a peaceful life is fear. The Dalai Lama teaches us that there are two kinds of fear: “Mad dog fear” where you should take some precaution of the difficulty you’ve come upon because it truly exists in reality and right in front of you. If a force of nature is staring you down and there is danger, fear is our instinct and can serve you well. The other kind is the “fear of death” which is going to happen anyway. We fear the things we cannot control and it effects our thoughts and lives. Lots of the fear we experience is not based in reality and it would be better for us to let it go and not try to control the outcome. We are the creators of our own fear, so we can’t ask anyone but ourselves about fear. We have to learn how to solve it, but first we have to know what kind of fear we are dealing with. Educate the next generation about this distinction and you are arming them with a valuable tool to live a more peaceful life. My lesson I take from this experience is that being happy is important. “Just in this life, be more happy” he told us. When asked if he has achieved ultimate happiness by a young audience member, his answer was “My way of thinking makes my happy face. You can also have a happy face and then share it with others”. The goal of all humans should be a compassionate world. How can we look into the eyes of the next generation and hope for anything less? The Dalai Lama lives on The Brightest Side, and so should we all. Is setting a goal really just about the goal? Or, is it about the process of setting that goal, seeing it through and the sense of accomplishment you feel when you get to where you want to be? Setting a goal allows you to outline what you want, brainstorm how to get there and put your plan into action, but setting a goal is more about the journey to get there. It’s always about the journey. And the secret to this journey is adding the key ingredient… intention. Setting a goal and setting an intention are two very different things, but they get grouped together and confused very often. If the goal is to drive from point A to point B, then your intention is how you exist in the car during the trip. A goal is a future event or action, but setting your intention is deciding how you want to exist in each moment until your goal is reached. You have the ability and the choice to respond to each moment. We have to make the choice about how to respond over and over each day. Setting an intention of being calm and thoughtful before speaking is one way to constantly remind yourself of that choice. But, it’s up to you to see it through and it’s up to you to give yourself the freedom to adjust your intention if that is what you need. Goals are future plans, intention is right here in the moment. Even if you never reach your goal, your intention still guides your actions moment to moment. Your intention is your relationship with yourself and how you relate to others. Setting an intention can happen once at the start of your day, or it can happen several times throughout the day to help you carry on. If you get confused at any time about how to set an intention or the difference between that and a goal, the best thing to remember is that whatever your question may be, about anything in your life... the answer is always kindness and compassion toward yourself and others. Before you even begin to set a goal or an intention, be sure that you have a strong base and foundation from which to build everything else on. Setting intentions and defining goals is pretty important to mapping out your strategies in all parts of your life, but what happens when we set goals when our mind is feeling scattered or our energy is not positive? Before even considering how you will conquer anything from a life goal to even just a task on your to do list, you should check in with yourself and take the temperature of your current state of mind. How are you feeling? What is happening that may influence your process or ability to set realistic goals? Do you have authentic intention? Setting the goal is the easy part. Getting a clear mind to set an authentic realistic finish line is the part many of us skip or forget to be mindful of. Consider your state of mind before making any major decisions or future plans. Your belief in your ability to succeed and thrive has to be authentic BEFORE you set a goal or an intention. Goals made with feelings of doubt or self-sabotage are doomed to fail before you begin. This may seem pretty obvious, but if we are being brutally honest with ourselves, we already know the outcome before we set the goal. Acknowledging a goal, speaking it out loud or writing it down is often just the catalyst to get the party started. If you can envision yourself succeeding, then the process is easy no matter how hard the road to get there. Expect failure and the road ahead will be as bumpy as you think it will be. You have all the power to control your journey. Thinking positive and having an authentic belief in yourself leads to seeing THE BRIGHTEST SIDE of everything. An intention set in a positive mind will succeed because any outcome is a win or a lesson learned and either one means success. Try setting a goal, an intention and considering the result with the Best Intentions Worksheet found in the LIBRARY tab of this site. This worksheet will give you an opportunity to take a closer look at your process and bring focus to the parts that need your attention. Be gentle with yourself. We set goals all the time. Short term goals, long term goals, realistic goals and goals that keep us moving through each day with a purpose. Goals move our feet in the right direction when they want to veer off onto the wrong path. Setting goals can keep you grounded. Being realistic and not overzealous with your goal setting will serve you best in the end. Dreams...... ahhhh dreams..... it’s just as important to dream as it is to be serious and work toward your goals. You could reach your goals with a staircase built one step at a time, but you should have to sprout wings and fly to your dreams. They should be that far off and exciting! Look way off in the distance at what you wish for. No limits. Give as much energy to those thoughts as you do to your grounded goal setting thoughts. They are just as important and should demand just as much attention. If you devote the right amount of time and energy to both goals and dreams, they will serve each other and provide balance for you. And when dreams float down close to you, or you can finally build your staircase to reach up and touch them, then do it! Like catching a butterfly, enjoy watching your dreams float beautifully around you until the time is right to swing your net. Just know that some dreams are better left to fly free and be admired. Your thoughts, dreams, plans and goals all have great value and deserve attention. I believe the greatest fear of some people is success. Imagine that. But, give some thought to a life filled with milestones of goals attained and dreams fulfilled! You deserve it and anything is possible. Just look on THE BRIGHTEST SIDE and see yourself and your goals and dreams in a whole new light.